Preheat an oven to 375 degrees F (190 degrees C). Grease an 8×8 inch baking dish. Cut tops from tomatoes; remove seeds and membranes. Place tomato shells upside down on paper towels to drain until filling. Place the bacon in a large, deep skillet, and cook over medium-high heat, turning occasionally, until evenly browned, about 10 minutes. Drain the bacon slices on a paper towel-lined plate, reserve drippings. Crumble bacon and set aside. Return 2 tablespoons of drippings to skillet. Cook onion in the bacon drippings until tender, about 5 minutes. Stir in spinach; cook and stir until wilted, about 2 minutes. Remove from heat. Stir in sour cream, reserved crumbled bacon, and hot pepper sauce. 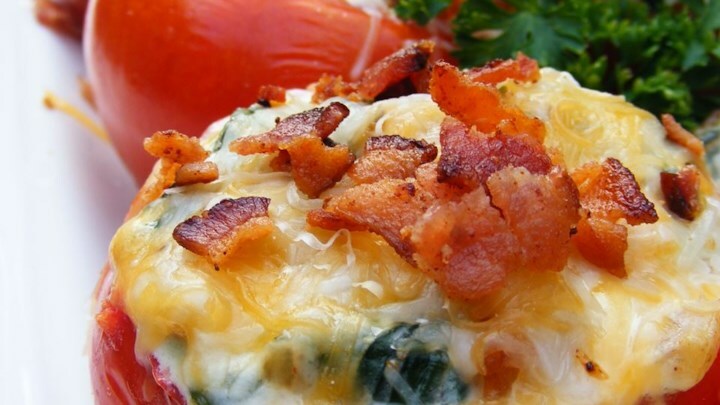 Sprinkle tomato shells with salt; fill evenly with bacon and spinach mixture. Place tomatoes in prepared baking dish. Bake in preheated oven until hot, 20 to 25 minutes. Remove, and top evenly with the shredded cheese. Return to the oven; bake until cheese is melted, about 5 minutes. Per Serving: 262 calories; 21.3 g fat; 9.7 g carbohydrates; 9.9 g protein; 43 mg cholesterol; 378 mg sodium.